Following my prior post GDC08: Newly Expanded Summits Broaden Serious Games Coverage, and now examining the detailed conference program, I've realized that over the last 12 months I've missed to cover a couple of great initiatives that the summit shall spotlight . Between today and the Serious Games Summit GDC opening on February 18 I will try to close the gap. In 2007 Chris Swain lead a USC Annenberg School team to design a "Serious Game" with the purpose of helping the public understand the process of legislative redistricting and reforms related to redistricting. 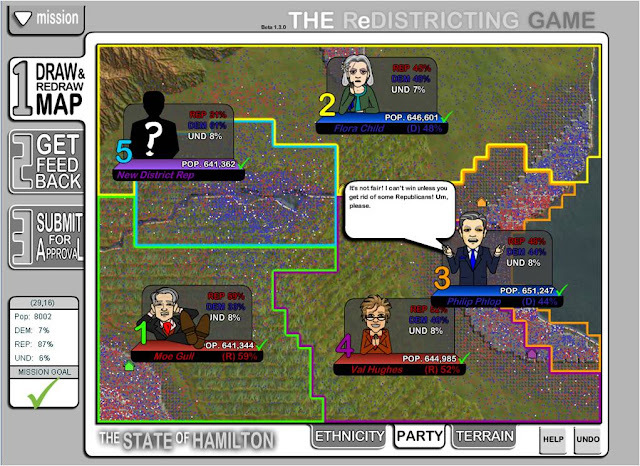 THE ReDISTRICTING GAME tries to capture the core yearning for optimization process that exists in redistricting but then attempts to show users various proposed reforms in the process as new constraints on the rules of the game. In this session, Chris will present the full version of THE REDISTRICTING GAME. Two leads from the audience will be announced and then each lead will have over 24 hours to compile ideas into a quick presentation for the following day detailing an imagined 2.0 version of the game and associated project. The goal of this session is not to just make the game itself better but to figure out new ideas the potentially improve the impact of the project's mission. THE ReDISTRICTING GAME was a cross-disciplinary effort that included faculty from the USC School of Cinematic Arts, Annenberg School of Communications, and Gould School of Law. It was funded by the USC Annenberg Center for Communications. 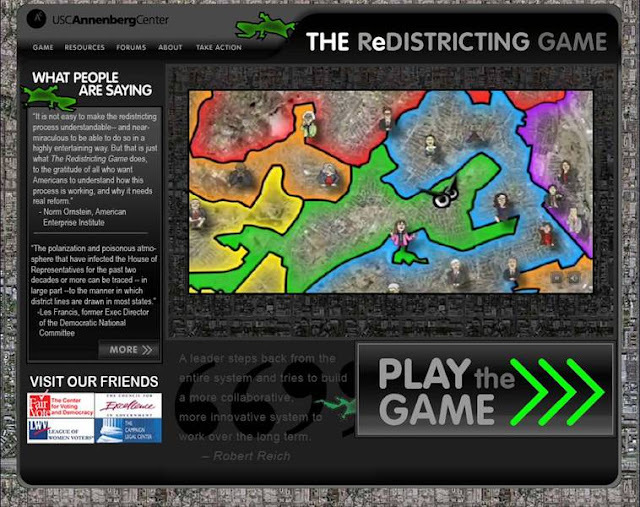 The purpose of the game is to educate people about the problems associated with congressional redistricting and empower them to take civic action. The game is consciously non-partisan and the player can play as either political party. In the game, the player works within the real rules of redistricting used in most U.S. states. The player gains intimate experience with drawing district maps and dealing with strong-headed party bosses, politicians, activists, and the courts. It's pretty easy at the start: you decide if you want to play as a Democrat or a Republican, and then redistrict the fictitious state of Jefferson to ensure that each congressional district has (roughly) the same number of citizens. Fortunately for you, it's a one-party state, which makes it easier to keep both congress critters and constituents happy. But create erratic borders, say, or a redistricting plan that places a representative's home outside of her district, and the Representatives will get cranky, and you'll get a word balloon telling you just how you screwed up. And even if you come up with a plan they everybody can live with, it still needs to win approval from the legislature, the governor and the courts. In addition to the basic level, THE ReDISTRICTING GAME has four additional levels that engage the player in manipulations of voter rights taken straight from the history books, each with a different mission and two levels of difficulty. Two levels involve gerrymandering, an American political tradition in which a district's boundaries are redrawn to create or retain a voter base that will keep certain individuals or a particular party in power. (The term dates to 1812, when Massachusetts Governor Elbridge Gerry signed into law a map that included a very blatantly manipulated district; this vaguely salamander-shaped new creature was dubbed a "gerrymander.") One gerrymander level is partisan and the other bipartisan; in each you need to redraw districts to gain a particular advantage for the party of your choice, and then cope with the ensuing complications. The fourth mission involves the U.S. Voting Rights Act of 1965, which, among other things, suspended the use of literacy tests and poll taxes to qualify voters on the grounds that they effectively barred poor and minority citizens from the polls. 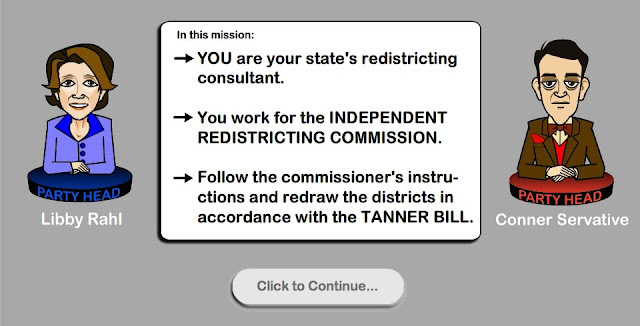 In Mission 5 there is a switch to use the rules/laws in Representative John Tanner's Fairness and Independence in Redistricting Act (H.R. 543). So, after playing different missions the player can see how the system works today and how it would work under specific reform laws. 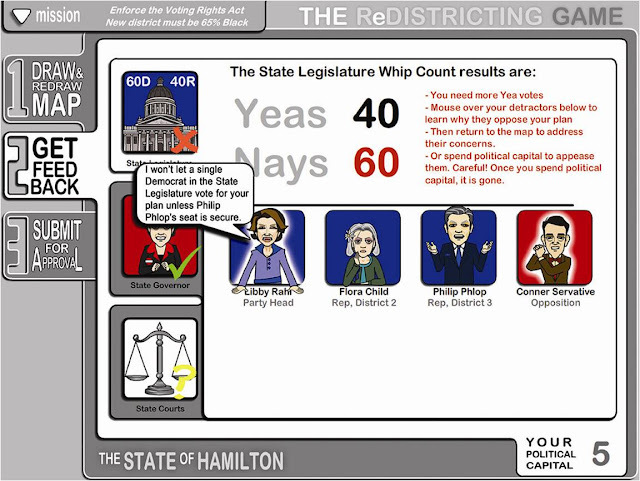 The game provides a basic introduction to the redistricting system, allows players to explore the ways in which abuses can undermine the system, and provides info about reform initiatives to demonstrate the ways that the system might be made more consistent with tenets of good governance.